Just About Anything: Kikamz, Where Have You Been? Perhaps many of you are wondering where I have been. I missed Sati's baptism last December 27th because I was away. I failed to greet everyone a Happy New Year when the clock struck twelve on New Year's Eve. But rest assured that I said a prayer for all of you my dear blogging friends. 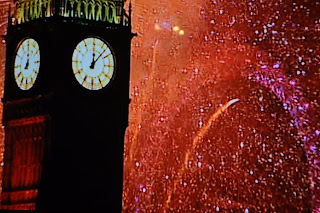 View of the Big Ben and the London Eye on New Year's Eve. So where have I been the past few weeks? I have been to London to visit the queen, er the queen's subjects a.k.a my brother in law's family. We celebrated Christmas and New Year with them and I can say that we had a really wonderful time. They live on the southern side of England, in a beautiful city called Bournemouth which is famous for its Beach. And although they don't get much snow like the rest of England does, it was still very cold because it was very humid. Samantha enjoying the beach for the first time. 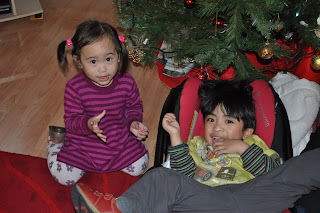 Samantha got to know her Tito and Tita and she got to play with her three-year-old cousin. It also meant time away from all the house chores for me (except for laundry and cleaning sam's bottles) and time for hubby to relax. He was in front of the TV most of the time and watched Discovery, NatGeo and everything the he fancies watching on Sky. Pano, walang English channels dito sa bahay. Samantha and her Kuya Luis on New Year's Eve. We did visit London for three days and because of the weather condition and a small child in tow, we didn't get to see everything! We missed exploring the British National Museum, St. Paul's Cathedral, Tower of London and Westminster Abbey and skipped shopping at Harrod's and Oxford Street but we did get to see many sights. I, of course, will update you about them in the days to come. I was going to post photos of Sam and her cousin but the CD was corrupted. Too bad! I should ask Kuya to burn another copy and send it to us. Pronto! wow. super lamig sa London ngayon sabi ng tita ko e. waahh!! di ko keri. now i know where you've been...:D haha? And I wonder if the beach turned into ice too.. looks chillin..
another travel na naman... so lucky Sam =) sya pa lang ang alam ko well travelled kid.